There are a thousand things that must be done before you can really sit back and enjoy your new home after experiencing a Logan to Brisbane removalists primary among them being locating a new residence, moving your household effects and settling down. Invariably, you would have done all, well in time, apart from the business of packing and moving. Suddenly, you are faced with a crisis that seems insurmountable – till you contact us. We are Roadways Furniture Removals, the acknowledged experts in the interstate removals business with a reputation born out of a confident expertise and nationwide coverage that is a delight to our clients. Roadways specializes in furniture removals and has an unmatched coverage of the nation – if there is a destination, we guarantee that we cover it better than anybody else in the business. Packing: Packing your household effects, safely and securely, is a science and art born out of experience, and we have years of that. Roadways has a team of expert packers who will take care of your belongings and pack them with appropriate materials so as to ensure safe transport and zero damage. Our packers are sensitized to taking special care of delicate and expensive items like crockery and electronics. Transporting: When you engage Roadways, you have the peace of mind that comes with a service provider that has a large network of interstate removals trucks. The experienced drivers are familiar with the routes and take special care to ensure that your goods are carried efficiently and swiftly. Backloading: Moving residence can be harrowing, as well as an expensive proposition, and we appreciate that you would not want to engage a full truck for a load that is not so bulky. Our premium backloading service allows you the flexibility of riding piggyback on trucks that are travelling to the same destination with lesser loads. This service comes easy on the pocket and you pay for only what needs to be carried and not empty space in a truck. Customised Services: We appreciate that transporting the bulky and fragile piano or that massive crystal chandelier would be giving you sleepless nights but with Roadways, you need not worry. We have customized solutions for such jobs. We have, at hand, a full range of trolleys that make piano removals a breeze. Delicate and odd-shaped items are buffered with impact-absorbing packing materials and rigid double-walled corrugated paper boards to ensure no damage during the removal process. 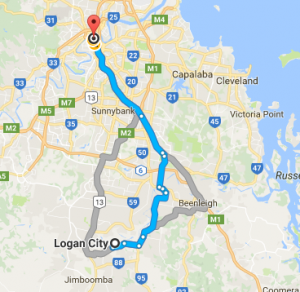 Our range of Logan to Brisbane Removalists services is comprehensive, yet simple in structure and pricing. You can engage us for specific activities or for the entire full service removals. We offer the best of standard plans and to cater to special requests, we develop customized solutions too.